Bio-Chest’ to augment MCT’s zero garbage initiative. The ‘Bio-Chest’ units, with capacity to handle 500 kg per day, can convert both dry and wet waste into compost within 21 days. This facility, officials said, would reduce the burden of shifting the organic waste to dumpyards or to centres following traditional composting practices. 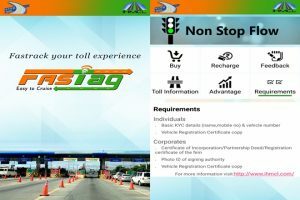 FASTag is a simple to use, reloadable tag which enables automatic deduction of toll charges and lets you pass through the toll plaza without stopping for the cash transaction. FASTag is linked to a prepaid account from which the applicable toll amount is deducted. The tag employs Radio-frequency Identification (RFID) technology and is affixed on the vehicle ‘s windscreen after the tag account is active.